Former Rep. Jesse Jackson Jr., holding back tears, entered a guilty plea Wednesday in federal court to criminal charges that he engaged in a scheme to spend $750,000 in campaign funds on personal items. He faces 46 to 57 months in prison, and a fine of $10,000 to $100,000, under a plea deal with prosecutors. In a 17-page prosecution document, Jackson’s wife admitted that from mid-2006 through mid-October of last year, she failed to report $600,000 in income that she and her husband earned from 2005 to 2011. Before entering the plea to a conspiracy charge, Jesse Jackson told U.S. District Judge Robert L. Wilkins, “I’ve never been more clear in my life” in his decision to plead guilty. Later, when Wilkins asked if Jackson committed the acts outlined in court papers, the former congressman replied, “I did these things.” He added later, “Sir, for years I lived in my campaign,” and used money from the campaign for personal use. “In perfect candor, your honor, I have no interest in wasting the taxpayers’ time or money,” he said. U.S. Attorney Ronald Machen called the guilty plea “so tragic because it represents such wasted potential” and that Jackson used his campaign as “his own personal piggybank.” He said that Jackson could have been the voice of a new generation. Machen credited Jackson for coming in early and telling the truth. “But today is his day of reckoning,” the prosecutor said. Machen declined to say what launched the investigation, but he said it did not stem from the House Ethics Committee investigation into Jackson’s dealings with Rod Blagojevich when he was governor. Blagojevich is serving a prison sentence for trying to sell President Barack Obama’s former Senate seat. Jackson’s father, civil rights leader Jesse Jackson, sat in the front row. Before the hearing started, he wrote notes on a small piece of paper. When the proceedings started, he sat expressionless and virtually motionless, hands folded. As he made his way back to the courtroom for Sandra Jackson's hearing, he took in a deep breath and let out a sigh. Several other family members also attended. “Tell everybody back home I’m sorry I let them down, OK?” Jackson told Chicago Sun-Times Washington bureau chief Lynn Sweet, according to her Tweet from the scene. Sandra Jackson, 49, wearing a black pantsuit, sobbed visibly during her court hearing, as her husband watched from the row behind the defense table. Sandi, as she’s known, was a Chicago alderman before she resigned last month during the federal investigation. Jesse Jackson Jr., 47, used campaign money to buy items including a $43,350 gold-plated men’s Rolex watch and $9,587.64 worth of children’s furniture, according to court papers filed in the case. His wife spent $5,150 on fur capes and parkas, the court documents said. Under the plea deal, Jackson must forfeit $750,000, plus tens of thousands of dollars’ worth of memorabilia items and furs. Sandi Jackson must also pay $168,000 in restitution. —A $466 dinner for two of “a personal nature” at Mandarin Oriental’s CityZen restaurant. —A washer, a dryer, a range and a refrigerator for the Jacksons’ Chicago home. —A five-day health retreat for one of Mrs. Jackson’s relatives. According to the prosecution’s court papers, Jackson even arranged for the use of campaign money to buy two mounted elk heads for his congressional office. Last summer, as the FBI closed in, a Jackson staffer identified only as “Person A” tried to arrange for the sale of the elk heads, but the FBI was one step ahead. The bureau had an undercover FBI employee contact the staffer, claiming to be an interior designer who had received the person’s name from a taxidermist and inquiring whether there were elk heads for sale. They agreed on a price of $5,300. Jackson’s wife, knowing that the elk heads had been purchased with campaign funds, directed the staffer to move the elk heads from Washington to Chicago and to instruct the sale contact to wire the proceeds to her husband’s personal account. Over the years, the unidentified “Person A” provided significant help to the Jacksons in carrying out the scheme. Jackson used the aide for many different bill-paying activities, including paying construction contractors for work on Jackson’s Washington home. From 2008 through last March, Jackson’s re-election campaign issued $76,150.39 in checks to the staff member, who was entitled to only $11,400 for work done for the campaign. The aide spent the remainder of the funds from the campaign for the Jacksons. One of Jesse Jackson Jr.’s lawyers, Reid H. Weingarten, told reporters after the hearing that there’s reason for optimism. “A man that talented, a man that devoted to public service, a man who’s done so much for so many, has another day. 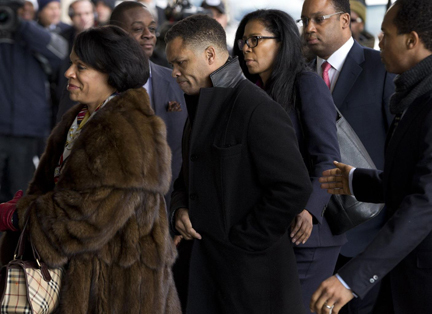 There will be another chapter in Jesse Jackson’s life,” he said. As a Harvard Law School student, Wilkins said he had supported the presidential campaign of Jackson’s father and that as an attorney in 1999, Wilkins had been a guest on a show hosted by Jackson’s father.